2008 can't conclude fast enough. It was overloaded with personal misery and financial ruin. But wait! It wasn't a complete disaster. In fact, I had some great times during the past year. Here's a partial list of the good stuff. *I was on crutches when the year began. I now walk freely without pain. *It seems like a dream nine months later, but I visited Great Britain in March. 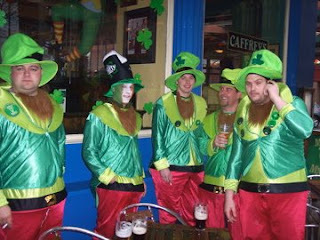 (I befriended these hearty, beer-guzzling chaps at ten in the morning on St. Patrick's Day.) I also hiked in the Rockies and swam with dolphins in the Pacific. *I really didn't mind getting laid off from a dead-end job. I co-founded a company that has limitless potential. 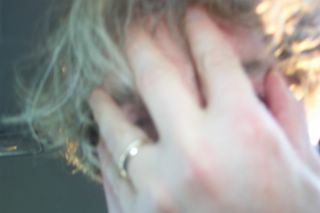 *I witnessed over 250 individual live music performances in 2008. My couch misses me. *The athletics department of the University of Kansas brought me enormous pleasure. A national championship in men's basketball was complimented by a victory in the Orange Bowl. *This blog thing remains fun. Winning the Pitch's "Music Blog of the Year" awards for Plastic Sax and There Stands the Glass was really nice. And get this- not once did I peek at my stat counters in 2008. Thanks for reading. Happy New Year! Here's to more money and no more crutches! What is the new business you started? It's a marketing company, Warren. And no, I'm not selling. I will, however, take you on as a client. Happy new year, my friend. May we all find happiness (and a big bag full of cash) in 2009!